This nice purse makes a great small handbag or a fancy cross body bag. · Removable hand strap: 9.5"; drops 6.3". · Detachable and adjustable long shoulder strap: 23.6"-47.2"; drops 22.4". · Supple quality vegan leather with natural pattern. · The straps are both made with premium synthetic leather. It's ideal for shopping, gathering, dating, traveling, etc. 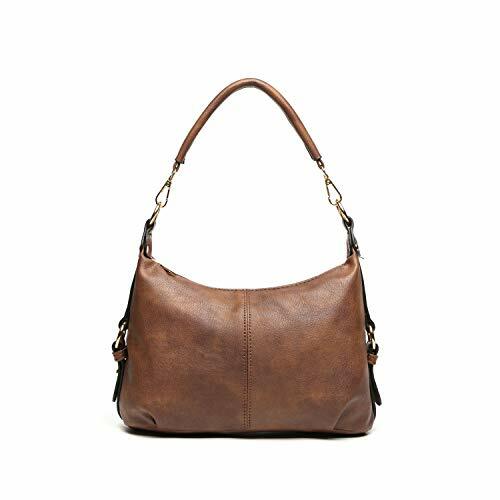 It's great whenever you need to carry your necessities easily without carrying a big purse. - Be sure to compare the purse with any bag you have in case the size doesn't meet your expectation. - It may have natural odor at first, but the smell will disappear after a couple days' airing out. Approximate dimensions: 9.8" long, 3.9" wide, 6.3" high. Comfortably holds your cellphone, iPad mini, makeup kit, wallet, etc. A 6.7" x 3.9" zipper pocket at the back can fit your smartphone with case. Double removable straps attached. One short hand strap (9.5", drops 6.3", not adjustable) and one long crossbody strap (23.6"-47.2", adjustable). The straps are both made with high quality vegan leather. Capacity: A main zippered pocket with 2 interior slip pockets, 1 interior zippered pocket, 1 small compartment and 1 wall zippered pocket inside. 1 zippered pocket at the back. Perfectly designed for everyday use, travelling, shopping, works, etc. Package will also come with an extra nail clipper as a gift. Please be sure to compare the purse with any bag you have in case the size doesn't meet your expectation. If you have any questions about this product by Katloo, contact us by completing and submitting the form below. If you are looking for a specif part number, please include it with your message.